Eden’s favorite thing to eat was hazelnut cream. She thought her mum’s was the best in the whole world. One wintry morning, while she was coloring on some paper, her mum said, "Eden, would you like to help me make some hazelnut cream for tea tonight?" Eden’s eyes got big and her mouth began to water. "Oh, yes, Mum! I want to help!" This was the first time her mum had offered. "What should I do?" "Wash your hands first. It’s very important to have clean hands before you cook. Use the soap!" she called after Eden, who was already running to the sink to wash her hands. She watched as her mum chopped the hazelnuts. "Eden, you can dump the cream in now, if you’d like. Go to the refrigerator and get the bottle of cream out, carefully." Eden opened the refrigerator door and grabbed hold of the bottle. She must not have dried her hands very well because the glass bottle slipped right out of her hands. It didn’t break, but the cream ran all over the floor. "I’m sorry, Mum. I didn’t mean to spill it!" she cried. Eden’s mum wasn’t angry with her. "We won’t be able to make hazelnut cream tonight now. Why don’t you get some paper towels and help me wipe up the mess," her mum sighed. "Can’t we go to the shop and get another bottle of cream?" Eden asked. "We could, but we wouldn’t have time to make it. I’ve got to fix tea. There’s so much to do still. I’ll pick some up tomorrow and we’ll make it then," her mum promised. She fixed a delicious tea for them. She made hot scones with creamy butter, boiled potatoes, peas, and fried haddock. "What, no sweets?" Eden’s dad asked, smiling. "Daddy, I spilled the cream today and so we couldn’t make the hazelnut cream. But tomorrow we can!" she said. 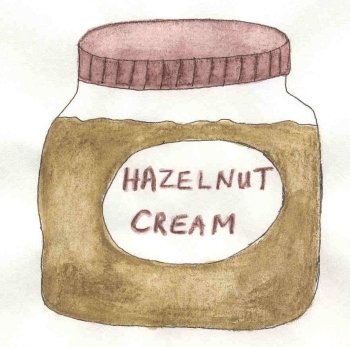 That night, as she lay in her bed, she dreamed about hazelnut cream. She thought of big, thick chocolates, filled with the cream, cakes with the cream drizzled all over and it and even hot scones, with hazelnut cream butter. As soon as she was finished eating breakfast, she and her mum went to the shop. "We’re getting cream to make hazelnut creams!" she beamed, talking to the shop owner. "My mum is going to let me help, but I have to be careful not to drop it this time." "Aye, lass, you be careful and not be cutting yourself!" the shopkeeper answered. When Eden and her mum arrived home, they made the cream. Eden didn’t drop the cream this time. She stirred it with cocoa and vanilla and sugar. The hazelnut cream turned out perfect. She couldn’t wait for her dad to come home so she could let him try one. After a supper of mince n’ tatties and corn, Eden said, "Daddy, there’s a sweet tonight and I helped make it!" "Yes, and can you guess what it is?" she asked. "Um, could it possibly be hazelnut cream?" "Yes, Daddy. How did you know? Mum made a cake. Here’s your piece. Now, pour the hazelnut cream all over it, just like I’m doing," Eden said, showing him exactly what to do. "Just like this?" he teased. "Yes, Daddy. Now, take a bite." He put a spoonful of the cake and cream into his mouth. "Oh, that’s delightful. What a delicious sweet. Thank you, Eden." She couldn’t answer because her mouth was so full of cake and hazelnut cream, her favorite thing to eat!